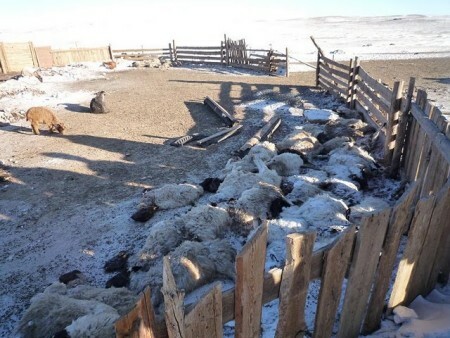 Harsh winter and low foodstock are causing the livestock in Mongolia to perish. Image courtesy Cambridge Mongolia Development Appeal. 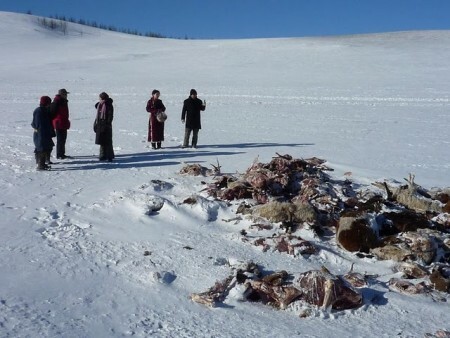 Recent news reports inform that Mongolia is witnessing the fiercest winter in living memory and adding to the misery decreasing foodstock may leave approximately 20 million farm animals frozen to death before Spring. The United nation warns that thousands of Mongolian nomad families face food shortages and severe poverty because approximately 1.7 million of their farm animals including sheep, camels and cattle have already been killed because of the harsh winter. Unicef already appealed for funds because dormitories of children need urgent aid due to insufficient food and fuel for heating and cooking. Here is a shocking video of a TV coverage of the disaster. “Dzud is a disaster that stretches well beyond the obvious. As you may know, a large percent of Mongolia’s population make their living herding animals for wool and meat: cattle, yak, sheep, cashmere goats, and Bactrian camels. Their land is uniquely suited for this. This life, of course, is highly dependent on the weather and availability of forage. Dzud actually begins in a dry summer when the grasses don’t grow much, what there is, is grazed short, and it’s not possible to put away much hay for the winter. “Not this year. Dzud means the elements reverse in winter: it’s brutally cold, often -40F/C or less before factoring in wind, with blizzards that cover the grasses with impenetrable snow drifts. So there’s the immediate, terrible loss as livestock die. Mongol and international aid authorities are saying this is the worst dzud in at least 30 years; already well more than a million animals have perished. Mongolian animal herds are being reduced by 10% each week. Image courtesy Cambridge Mongolia Development Appeal. The Cambridge Mongolia Development Appeal From UK has issued this appeal for donations, Bitterroot has more suggestions. This unraveling disaster in Mongolia has no celebrity spokespeople, no telethons, no convenient cell phone donation numbers, no TV cameras on the ground (would they even work when it’s 40 below) to show the heartbreaking pictures, none of that. 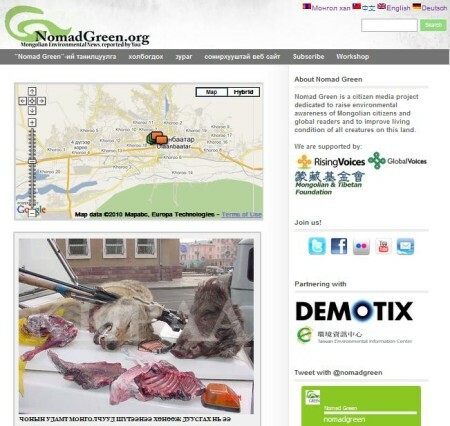 The citizen journalists of Nomad Green, a Rising Voices grantee in Mongolia has been trying to create awareness about the worsening environmental crisis in the country with their coverage of environmental reporting. Because our range-land is degraded, most of the herders have moved at least 100 km, or even further than 200-300 km from their original winter places. On the way, no grass is observed on the ground, only shrubs stayed without leaves and branches. I think that winter would be hard. Sir/ madam Pralaiment Member(s), the people are waiting for your promise, cash and other donations. Particularly, the herders are still waiting for your promise to let their livestock killed by disaster. Pralaiment Members seem like that they don’t know that the herders plan their activities accounting based on promised money, which would be a block to arrange their livelihood. Otherwise, they know this situation but they are really too busy for planning next plan for coming election. No wonder many herders and their livestock were caught up in that disaster unprepared. Right now people known about desertification and land degradation which both influence changes of range-land quality, but they don’t know how the disappearing range-land influences their livestock quality. The desertification can influence livestocks’ body development. In order to preserve the balance of the ecological environment, we need to conserve our wildlife. Boldkhuyag reports that the government spending on decreasing air pollution level of the Mongolian capital Ulaanbaatar has increased. However no progress is evident which points to the corruption of government officials. We are looking forward to more reports from the citizen journalists of Mongolia and suggestions from them how the world can help them overcome this disaster and save more animals in Mongolia. Thank you so much for this thorough roundup and citing my small contribution. I really hope that together we can save lives this winter, and that Mongolia can use this event to implement better, forward-looking policies to prevent such catastrophes in the future. This is terrifying. I really hope the MPs honor their promise, since it is very unlikely for the weather conditions to get better this time of the year. I just re-read this story, it made a big impact on me.